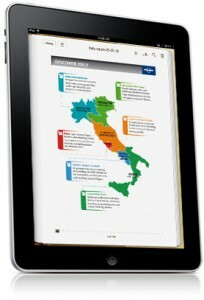 Discover Italy with Lonely Planet's new ebook series. Photo by Lonely Planet. Popular travel guide resource Lonely Planet recently launched their Discover ebook series for the iPad, available now in both the iBookstore and the iBooks application. Just like their bestselling print series, Lonely Planet’s Discover ebooks aim to help travelers discover the ‘must-see’ sights but adding lots of bells and whistles too. The interactive series is hooked up, with both the text and the detailed maps chock full of links to other areas inside the ebook and outside on the web. This interlinking allows you to easily navigate from editorial to specific points of interest to maps, making it a fantastic resource to have at your fingertips. You can bookmark your favorite sites to create your own travel “to-do” list, take notes as you go, Google for more information, email friends and family to share travel suggestions, navigate directly to the web from Lonely Planet’s provided hyperlinks to make hotel or restaurant reservations, check admission prices to that museum… the possibilities are endless. On top of all that flexibility and easy-peasy navigation, the Discover ebook series also has tailored itineraries by region, theme or length of stay to help you take advantage of your location. Tips, recommendations, and experiences to be had are provided at various price points, including luxury. Oh yeah, and the series is narrated with Lonely Planet’s stunning photography. The launch includes five titles, Lonely Planet’s European favorites: Great Britain, Italy, Spain, France, and Ireland, with more titles on their way. Here at TNN we advise to buy soon, the special promo price of $14.99 won’t last forever. John Boris, Executive Vice President Lonely Planet is optimistic on Discover’s launch, “With its interactive features, we’ve created a whole new way to read a guidebook.” Indeed, even this anti-Apple crusader agrees. The Discover ebook series really does sound like it’s going to reinvent how we plan for travel. Just want to say your article is as astounding. The clarity in your post is just spectacular and i could assume you’re an expert on this subject. Fine with your permission allow me to grab your RSS feed to keep updated with forthcoming post. Thanks a million and please carry on the enjoyable work.